tuneyoursound.com just finished a new project related to the collection we are managing. We had the opportunity to acquire John Cougar Mellencamp tattooed leather jacket from the ’80. This custom made jacket was part of the private collection of John Mellencamp's guitarist Mike Wanchic & Echo Park Studios. TYS is moving to the next level of sound experience. For some years we have promoted several highly skilled builders. We are now happy to announce that the family will be enlarged with Teye™ Guitars. TYS presents the World of TAO guitars: John Joveniaux and Serge Michiels are passionated about guitars! The most impressive at first sight is the look of the guitars. This may be best described as Neo-vintage. These are the Bugattis of the guitar world. The TAO Guitars are an impressive work of art and sound. Discover it with Willy Pultz a veteran of the Luxembourgish music scene. On 29.9.2016 Crossroads’ 15th Anniversary Concert at the Purple Lounge in Casino 2000, Mondorf was recorded with 7 cameras and 24 audio tracks. The DVD/BLU-RAY was filmed and produced by TYS and is now available trough the band's website Crossroads. Part of the TYS Collection will be on display from the 16 February until the 25 February 2017 at the Exhibition: Guitares de Rêve - The History of the Electric Guitar 1927 - 1957.
www.tuneyoursound.com supports local film projects by supplying instruments out of its collection. Recent loans were done for two Andy Bausch directed films Freddy (2015) and Sixty8 (in production). It is now 3 months that we have introduced our new website. We hope you enjoy it. Nevertheless it is still work in progress. Indeed we have a lot to do! In this section, you can see our selection of guitar and amps builders. Some of them, new or used, are for sale. 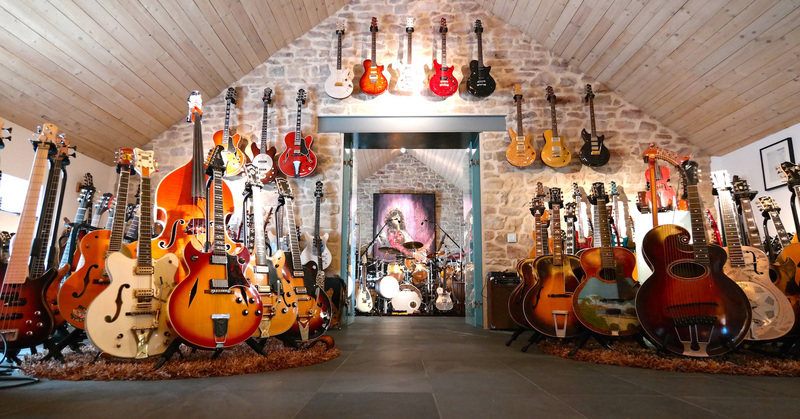 In this section, you can discover our collection including vintage guitars, basses and amplifiers and luthier instruments. Our intruments have their own history! Played by famous musicians or used on great songs or in live tours, we publish regularly 'behind the scenes' stories from our T.Y.S. COLLECTION. Read here what makes them unique. As a logical evolution Fender launched in 1954 a more refined guitar: the Stratocaster. The aim was to give the musician more comfort in playing the guitar. This was achieved by a new body design showing a more sleek and contoured body shape. This amp is the only surviving original Orange-Matamp with an aluminium chassis, of the 6 that went to the USA in 1969 with Matt Mathias, Peter Green and Fleetwood Mac. It has been in the same location since 1970 and was only recently rediscovered in a storage facility at Matamp.